The subject of this portrait is the highly respected William John Porritt of Helmshore. He was born in Ramsbottom in 1828 and died in 1896, aged 67. A workpeople’s memorial was erected in his honour at the Primitive Methodist Chapel in Helmshore. During the Victorian period portraits were a common record of posterity and were often given as gifts in acknowledgment of good service. However, this portrait suggests that it is one to acknowledge a position of stature as the angled seating position and dark unassuming background were common features of this type of painting at the time. If the portrait was for personal record and posterity it would have included symbolic items in the background to highlight and boast of his wealth and standing, using symbols of the weaving industry or symbols to highlight his affiliation with the Land and Building Company, which contributed to the expansion of St Annes. The Porritt painting gives an air of officialdom as he is wearing a conservative three-piece suit, which was common in that period. The artist has used reflection on the seams of the garment to show the good quality material. Porritt is adopting the traditional closed lip stare. Charles Dickens was reputed to have said that there were two types of portrait ‘the serious and the smirk’. Portraits often took many sittings so it is no surprise that the portrait is very similar to the photograph of Porritt in office around the1880s, which may have been used as a reference. 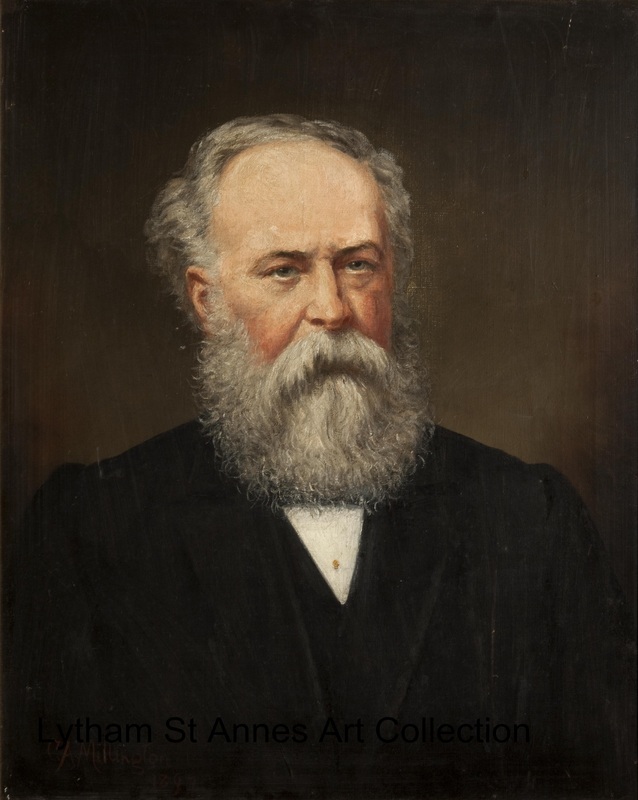 However, the portrait shows Porritt’s beard remarkably longer and wispy. The soft lines in his features do not show any signs of stress or worry and his eyes are soft and gentle; an artist’s way of capturing the soft and gentle personality of the sitter. The Porritts were one of the most respected families in Helmshore in the mid-1800s, being known as good employers and donating money for the welfare of local people. The health of the workforce was important at the time, life expectancy was then only around 50. Porritt often sent his workers to St Annes in order to convalesce and organised mill trips using special trains. Porritt worked at Dearden Clough Mill as a hand-loom weaver and served his apprenticeship in wool sorting, eventually becoming a cotton merchant. He contributed very heavily to the second wave of investment in the St Annes Building Company, which was responsible for creating the seaside town of St Annes that we know today. Some of the newly-built houses were built from stone from Porritt quarries at Helmshore and today the houses are still affectionately referred to as ’Porritt houses’. Porritt served as Chairman on the St Annes Board of Health from 1891 until 1894, which was later renamed the Urban District Council under the ‘Local Government Act of 1894’. Caroline Alice Millington was born in London in 1853 to James Heath Millington and his second wife, Caroline (nee Gilder). She had two sisters, Ada and Florence and a half brother and sister, James Burton Millington (artist) and Sarah Elizabeth Millington. They were born to their father’s first wife, Elizabeth (nee Burton), who died in childbirth in 1839. James Heath Millington was an artist of some renown. “In 1826 he entered the schools of the Royal Academy in London, and gained many prizes there, though he was not successful in winning the gold medal for painting. He first exhibited at the Royal Academy in 1831, sending A Portrait of J. C. Bishop, Esq. and Vulcan's Cave. He continued to be a frequent exhibitor of subject pictures, portraits and miniatures there and also at the British Institution and Suffolk Street Galleries up to 1870. Millington, who was for a short time curator of the School of Painting at the Royal Academy, died in 1873.” Dictionary of National Biography, Volume 37 by Lionel Henry Cust. Most sources give the date of his death as 1872. His place of birth is usually cited as Cork, Ireland, but census returns state it was Staffordshire. In 1871 the family was living in 5 Chepstow Place, Kensington, their home at the time of James’ death in 1872. Florence died a year later. Ada married George Brindley Jackson in 1876 and moved to Cheetham, Manchester. Caroline and her mother also moved to Cheetham and in the 1881 census Caroline was described as an artist. By 1891 Caroline and her mother had followed Ada to Heaton Norris, Stockport, where she was described as an artist and portrait painter. Ada and her family moved to Congleton in the late 1880s. Their last move was to St Annes in the 1890s, living at 24 North Promenade. Caroline and her mother followed them yet again, living at 4 The Crescent . George Brindley Jackson, a mineral and chemical merchant, died in 1903 and was buried at St Cuthbert’s, Lytham. Caroline, (the mother of Caroline Alice and Ada ) died the following year and was buried in the Jackson family plot. Caroline Alice was living at The Crescent, St Annes in 1911 with her brother, James Burton Millington, who was by then widowed and childless. Both were recorded as artists. James died in 1915 aged 77. Her sister, Ada, had moved along North Promenade to number 18 to live with her son, George. She died in 1929. Caroline died in 1935, her final address being 214 St David’s Road North. The sisters are buried at St Cuthbert’s, Lytham. Painting in oils and watercolours, Caroline often exhibited her work. The Manchester Courier and Lancashire General Advertiser of 13 October 1882, reporting on the Waites Autumn Exhibition, said her painting of fruit “shows much technical skill and delicacy of manipulation". She became a valued member of the Lytham St Annes Art Society and was a prolific artist who, as archived catalogues testify, exhibited regularly from 1923 until 1934. Her subjects were wide ranging and often commanded excellent prices. It was stated in their archives that she exhibited at the Royal Academy but the Royal Academy has been unable to find anything in their records to confirm this. 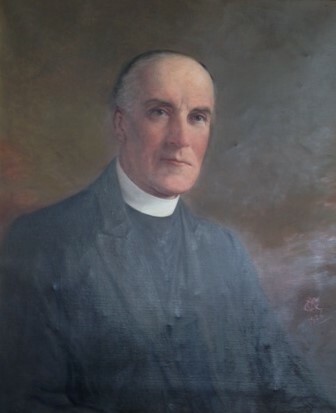 Her portrait of the Reverend Herbert Edward Butler, Vicar of St Annes Parish Church, 1903-1930. The signed portrait of 1926 is now in St Annes Church Parish Rooms. “Miss Millington deserved mention for the delightful, interesting little sketches illustrating the St Annes of years ago and also her poetic figure designs of Spring." "Veteran Artist. 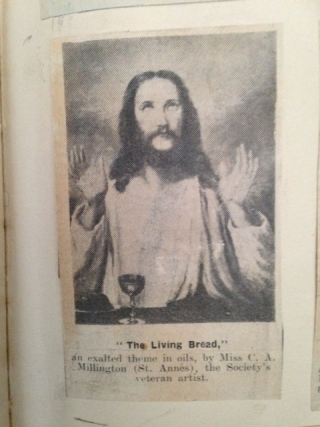 We hope the Society will retain for many years in its exhibitions the works of our veteran artist, Miss C. A. Millington, who ambitiously attempts the most exalted theme very capably in her picture, "The Living Bread", which is full of religious feeling. We congratulate our artist of longest residence upon such an example of energy and power." Her last entry for the Society was in the June Exhibition of 1934 Catalogue Number 48 entitled “Elaine”. The sitter was resident in St Annes on Sea for many years. Her maiden name was Lynda Marsden Bayley but she was also known as Lydia.